In this article, Megan Brashear, CVT, VTS(ECC), discusses the importance of measuring urine output, and in which patients this information is helpful. Let’s talk urine. More specifically, let’s talk measuring urine output. Are you doing it? And on which patients? If you are measuring urine output are you interpreting the results to be meaningful to your patient? Urine output measurement is an important part of patient monitoring and can alert you to major problems that you may not catch on physical exam. Urine output is a signifier of renal perfusion; a perfused kidney is a happy kidney doing its job. Patients who have experienced shock, hypotension, or any other situation where blood pressure to the kidneys was severely compromised can suffer long term kidney damage. If you are aware of such an event, monitoring for decreased urine output can alert you to such damage before performing blood work. Urine output will also clue you in to kidney failure; if output is consistently low or not responding to treatment, it is a way to evaluate kidney function without checking blood values every four hours. 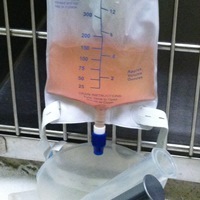 Monitoring urine output does not have to be an invasive, highly technical procedure. While the gold standard is placing an indwelling urinary catheter connected to a closed collection system, there are many other ways to look at urine and determine varying levels of information about your patient. First, determine the color. Dogs that are dehydrated will often have dark yellow urine. Brown urine can signify rhabdomyolysis, a dangerous condition from muscle breakdown that can lead to kidney failure. Red or orange urine can mean hemolysis, either from IMHA or from a mismatched blood transfusion, or hematuria from crystalluria or a bleeding disorder. If you can’t tell if the blood is fresh or hemolyzed, centrifuge the urine. A hemolyzed sample will retain the same color after spinning, frank blood will centrifuge out leaving a clear supernatant. Clear or very pale yellow urine may be normal for that animal, but can also signify overhydration or an inability of the kidneys to concentrate urine. As a technician, you can start a list of potential problems just by noting the color of urine. Monitoring the urine specific gravity can also give you a clue to the animal’s hydration status. Urine specific gravity is comparing the weight of urine (essentially the concentration) compared to distilled water. A specific gravity of 1.000 (the same as distilled water) is dilute, >1.040 is concentrated. Kidneys that are not functioning will be incapable of concentrating urine and will yield a low specific gravity; dehydrated animals will have concentrated urine. Monitoring trends in urine specific gravity can help you determine hydration and how well the animal is tolerating fluid therapy. Lastly, in many patients it is beneficial to measure the actual output of urine. Not only knowing how many ml/kg/hr produced, but their total input related to their total output. 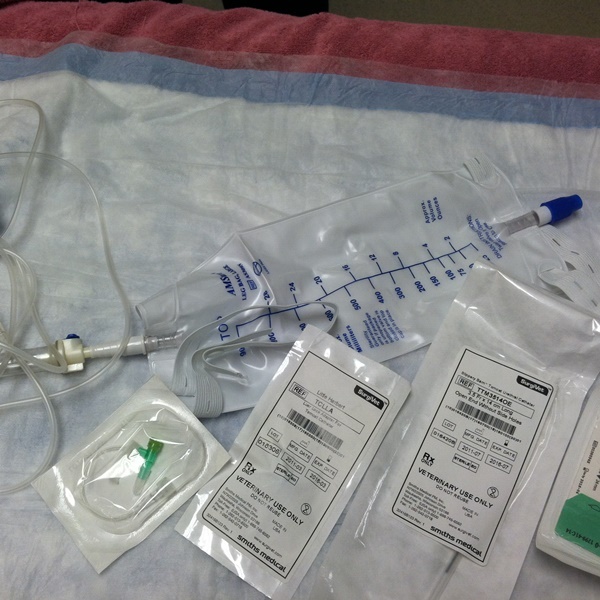 Again, the gold standard is an indwelling urinary catheter connected to a closed collection system where you can measure, to the mL, the amount of urine produced over a set time period (usually four hours). But don’t forget your low tech options. Is the dog walking outside? Bring a bowl and collect everything you can. Is the cat using a litterbox? Fill it with the little plastic litter pellets and draw up the urine into a syringe to quantify it. If the cat or dog isn’t getting outside or chooses not to use the litterbox, you can weigh potty pads or bedding before and after the animal urinates. The weight change in ounces is roughly equivalent to the ml of urine soaking them. These other methods are not as exact as a urinary collection system, but they sure beat guessing, and will give you valuable information about your patient. Normal urine output is 1-2 ml/kg/hr. To determine the urine output of your patient, you need to know their weight, the amount of urine produced, and the amount of time it took them to produce that urine. Urine output should be measured at least every four hours if possible. Once you know the urine output of your patient, it is important to look at that in relation to other outs (vomit, diarrhea, anything removed via NG tube, Jackson-Pratt drains, etc.) to get a complete picture. These are all sensible losses, or losses that are easily quantified. In febrile animals or dogs that are heavily panting, insensible losses (evaporation) should also be considered. Finally, compare the outs to what is going in. 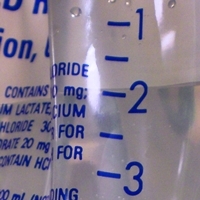 What is the ml/kg/hr of fluids going in? 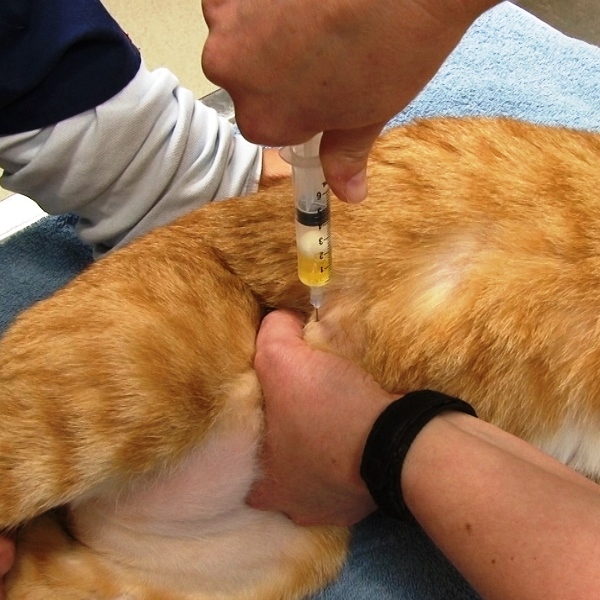 Is it a previously obstructed cat that is producing more urine out than he is getting IV fluids in? 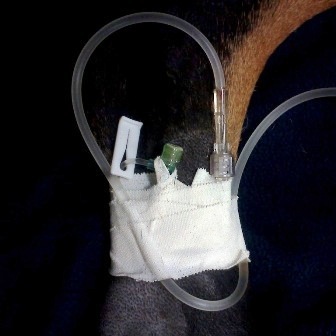 Is it a renal failure dog that has triple the volume of ins over outs? Every time the urine output (and other sensible losses) is measured, calculate the fluids in and compare. The goal is to have those number close, or at least approaching almost equal. Every 24 hours start back at zero and continue to track. From the relatively simple case to a critical patient, urine output is an important value to track. 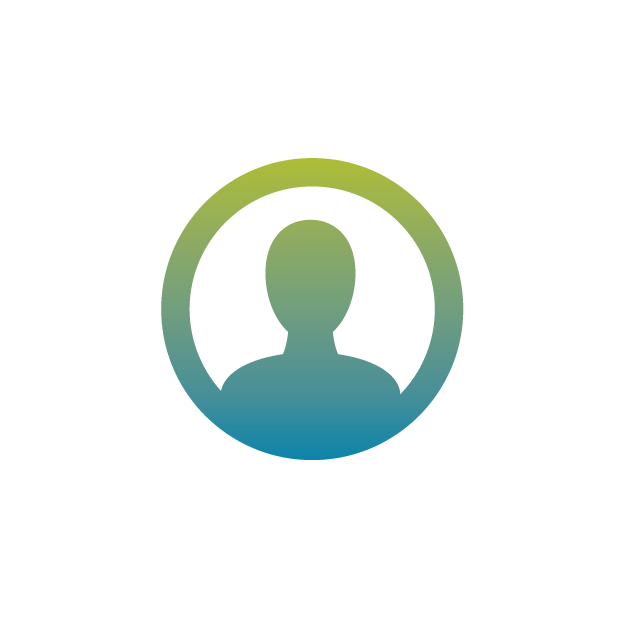 From the look to the weight to the actual amount of urine excreted you can gain important information about your patient’s overall status and be on the lookout for early changes. Happy measuring! Hi Mary- If it's the quiz you're looking for, you can find it at the top right of the page. Please let me know if you are still having trouble finding it!